Three Mile Island Nuclear Power Plant To Shut Down In 2019 : The Two-Way The company that owns the Three Mile Island nuclear plant, site of the worst nuclear disaster in U.S. history, says the facility will be closed unless the state of Pennsylvania decides to bail it out. Cooling towers at the Three Mile Island nuclear power plant in Middletown, Pa., earlier this month. "Today is a difficult day, not just for the 675 talented men and women who have dedicated themselves to operating Three Mile Island safely and reliably every day, but also for their families, the communities and customers who depend on this plant to produce clean energy and support local jobs," Exelon CEO Chris Crane said in a statement. 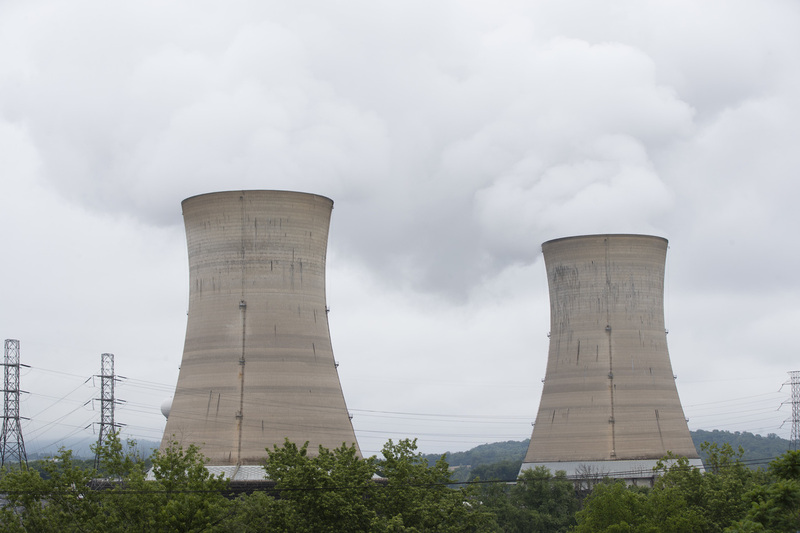 Tuesday's announcement highlights the challenges to the nuclear power industry — which "faces slowing demand for electricity, and competition from cheaper natural gas and renewables," as StateImpact Pennyslvania's Marie Cusick has reported. Exelon has been seeking the same kind of subsidies from Pennsylvania, which it provides to solar, wind and hydro energy power sources. As Cusick reported, New York and Illinois recently "agreed to give billions in subsidies to the nuclear industry by essentially broadening the definition of clean power." That's because nuclear reactors don't release carbon emissions. Opponents of the subsidies say nuclear energy is risky and more expensive than alternative forms of power. And environmental groups are mixed, Cusick said, with some stressing that nuclear power is not renewable. Exelon said Pennsylvania "has an opportunity to take a leadership role by implementing a policy solution to preserve its nuclear energy facilities and the clean, reliable energy and good-paying jobs they provide." It criticized the state's reluctance to subsidize the industry, saying it produces "93 percent of the Commonwealth's emissions-free electricity." On March 28, 1979, the core of one of Three Mile Island's nuclear reactors partially melted down. As NPR's Joel Rose reported, a problem with one of the valves was compounded by slow reaction from the operators at the time. "When the crisis ended five days later, relatively small amounts of radiation had escaped from the plant. No one had been injured," Joel said. "But the accident had a huge impact on the industry." The meltdown put the brakes on building new nuclear plants in the U.S., and prompted the industry to apply more stringent safety standards. It's becoming increasingly common for nuclear power plants in the U.S. to close in light of market conditions — as Bloomberg reported, at least five have shut down in the past five years. Three Mile Island has a license from the U.S. Nuclear Regulatory Commission to operate until 2034.